Two protocol emulators from GL Communications Inc. have just been enhanced to include automatic handling of SCCP parameters and low balance call floor scenarios. The product involved are the firm's MAPS™ CAP and MAPS™ INAP Protocol Emulators. The Intelligent Network (IN) is a network architecture used in fixed as well as mobile telecom networks and allows operators to provide value-added services in addition to the standard telecom services, such as PSTN, ISDN and GSM services on mobile phones. The intelligence is provided by network between functional entities such as Service Control Function (SCF) and Service Switching Function (SSF). Intelligent Network Application Part (INAP) and Customized Applications for Mobile Networks Enhanced Logic Application Part (CAP) are the protocols used in Intelligent Networks. INAP is for fixed networks whereas CAP is extended version of INAP and is used for mobile networks. 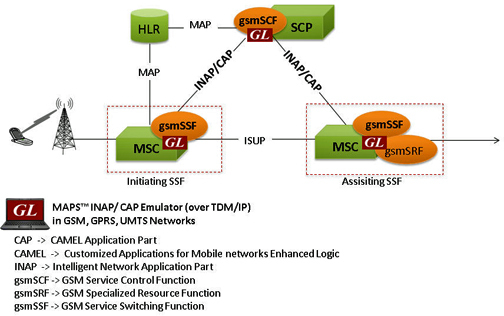 GL's Message Automation & Protocol Simulation (MAPS™) is an advanced protocol simulator/tester for INAP services. The tester supports testing network elements gsmSCF and gsmSSF, error tracking, regression testing, conformance testing, and load testing/call generation and is able to run pre-defined test scenarios against INAP test objects in a controlled & deterministic manner. GL's MAPS™ CAP Emulator can emulate CAP supplementary services such as unified messaging, prepaid, and toll-free (Freephone). These services are available in TDM and IP based GSM, GPRS, and UMTS networks. CAP information flow is defined between functional entities such as Service Control Function (SCF) and Service Switching Function (SSF) distributed across network executing services.